Jean-Baptiste Biot (/ˈbiːoʊ, ˈbjoʊ/; French: [bjo]; 21 April 1774 – 3 February 1862) was a French physicist, astronomer, and mathematician who established the reality of meteorites, made an early balloon flight, and studied the polarization of light. The mineral biotite was named in his honor. 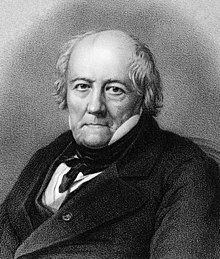 Jean-Baptiste Biot was born in Paris on 21 April 1774 the son of Joseph Biot, a treasury official. He was educated at Lyceum Louis-le-Grand and École Polytechnique in 1794. Biot served in the artillery before he was appointed professor of mathematics at Beauvais in 1797. He later went on to become a professor of physics at the Collège de France around 1800, and three years later was elected as a member of the French Academy of Sciences. In July 1804, Biot was on board for the first scientific hot-air balloon ride with Joseph Louis Gay-Lussac to measure how the Earth's magnetic field varied with elevation (NNDB 2009, Reese 2004, O’Connor and Robertson 1997). They reached a height of 4000 metres (13,100 feet) (NNDB 2009, Reese 2004). Later, in Sept. 1804, Gay-Lussac did a solo flight that took him up to 7010 metres (23,000 ft) (quite dangerous without supplementary oxygen (Reese 2004)). Biot was also a member of the Legion of Honor; he was elected chevalier in 1814 and commander in 1849. In 1815, he was elected a Foreign Member of the Royal Society of London, in 1816 a member of the Royal Swedish Academy of Sciences, and 1822 a Foreign Honorary Member of the American Academy of Arts and Sciences. In addition, Biot received the Rumford Medal in 1840, awarded by the Royal Society in the field of thermal or optical properties of matter. (O’Connor and Robertson 1997). In 1850 Jean-Baptiste Biot published in the Journal des savants a 7-page memoir from his recollections of the period of the late 1790s and early 1800s concerning his encounters with Laplace. Jean-Baptiste Biot had a single son, Édouard Constant Biot, an engineer and Sinologist, born in 1803. Edouard died in 1850 and it was only thanks to the extraordinary efforts of his father that the second half of Edouard's last book, the Chinese classic Tcheou-li, was readied for publication. It had been left in manuscript, unfinished. To publish it in correct form, Jean-Baptiste Biot wrote, he had to consult Stanislas Julien, the famous Sinologist, but also, especially for the translation of the most difficult part, the Kaogongji, he himself had to visit many workshops and questioned artisans and craftsmen about their methods and vocabulary in order to verify his son's work. To this day, Biot's translation remains the only translation into a Western language of this book. He died in Paris on 3 February 1862. Jean-Baptiste Biot made many contributions to the scientific community in his lifetime – most notably in optics, magnetism, and astronomy. The Biot–Savart law in magnetism is named after Biot and his colleague Félix Savart for their work in 1820. In their experiment they showed a connection between electricity and magnetism by "starting with a long vertical wire and a magnetic needle some horizontal distance apart [and showing] that running a current through the wire caused the needle to move" (Parsley). In 1803 Biot was sent by the Académie française to report back on 3000 meteorites that fell on L'Aigle, France (see L'Aigle (meteorite)). He found that the meteorites, called "stones" at the time, were from outer space. With his report, Biot helped support Ernst Florens Friedrich Chladni's argument that meteorites were debris from space, which he had published in 1794. Prior to Biot's thorough investigation of the meteorites that fell near l'Aigle, France in 1803, very few truly believed that rocks found on Earth could have extraterrestrial origins. There were anecdotal tales of unusual rocks found on the ground after fireballs had been seen in the sky, but such stories were often dismissed as fantasy. Serious debate concerning the unusual rocks began in 1794 when German physicist Chladni published a book claiming that rocks had an extraterrestrial origin (Westrum). Only after Biot was able to analyze the rocks at l'Aigle was it commonly accepted that the fireballs seen in the sky were meteors falling through the atmosphere. Since Biot's time, analysis of meteorites has resulted in accurate measurements of the chemical composition of the solar system. The composition and position of meteors in the solar system have also given astronomers clues as to how the solar system formed. In 1812, Biot turned his attention to the study of optics, particularly the polarization of light. Prior to the 19th century, light was believed to consist of discrete packets called corpuscles. During the early 19th century, many scientists began to disregard the corpuscular theory in favor of the wave theory of light. Biot began his work on polarization to show that the results he was obtaining could appear only if light were made of corpuscles. In 1815 he demonstrated that "polarized light, when passing through an organic substance, could be rotated clockwise or counterclockwise, dependent upon the optical axis of the material." His work in chromatic polarization and rotary polarization greatly advanced the field of optics, although it was later shown that his findings could also be obtained using the wave theory of light (Frankel 2009). Biot's work on the polarization of light has led to many breakthroughs in the field of optics. Liquid crystal displays (LCDs), such as television and computer screens, use light that is polarized by a filter as it enters the liquid crystal, to allow the liquid crystal to modulate the intensity of the transmitted light. This happens as the liquid crystal's polarisation varies in response to an electric control signal applied across it. Polarizing filters are used extensively in photography to cut out unwanted reflections or to enhance reflection. Potassium tartrate was first discovered inside of a wine container in Iran. The modern application of the substance began in 1768, and in 1832, Jean Baptiste Biot discovered the physical properties of cream of tartar. The item gained most of its popularity when the French began using it frequently in their cooking. ^ O'Connor, John J.; Robertson, Edmund F., "Jean-Baptiste Biot", MacTutor History of Mathematics archive, University of St Andrews . ^ Appletons' annual cyclopaedia and register of important events of the year: 1862. New York: D. Appleton & Company. 1863. p. 683. ^ "Fellow details". Royal Society. Retrieved 19 May 2016. ^ "Review of Anecdote relative à M. de Laplace par Jean Baptiste Biot". The Quarterly Review. 87: 115–118. June 1850. ^ J.B. Biot (1803) Relation d'un voyage fait dans le département de l'Orne, pour constater la réalité d'un météore observé à l'Aigle le 26 floréal an 11 [Account of a journey made in the department of the Orne [River], in order to ascertain the reality of a meteor observed in l'Aigle on the 26th of Floréal in the year 11 [Note: The date "26 floréal" on the title page is a typographical error; the meteor shower actually occurred on 6 floréal (i.e., April 26, 1803) and everywhere else in the text the date "6 floréal" is given as the date of the meteor shower.]] (Paris, France: Baudouin, 1803). ^ Biot, J. B. (1815) "Phenomene de polarisation successive, observés dans des fluides homogenes" (Phenomenon of successive polarization, observed in homogeneous fluids), Bulletin des Sciences, par la Société Philomatique de Paris, 190–192. Frankel, Eugene. "Corpuscular Optics and the Wave Theory of Light: The Science and Politics of Revolution in Physics." Social Studies of Science vol. 6, no 2. May 1976. Sage Publications, Ltd. 15 June 2009 <https://www.jstor.org/stable/284930>. Westrum, Ron. "Science and Social Intelligence about Anomalies: The Case of Meteorites." Social Studies of Science vol. 8, no.4 Nov. 1978. Sage Publications, Ltd. 15 June 2009 <https://www.jstor.org/stable/284819>. Crosland, M.P. (1970–80). "Biot, Jean-Baptiste". Dictionary of Scientific Biography. 2. New York: Charles Scribner's Sons. pp. 133–140. ISBN 978-0-684-10114-9. Gounelle, Matthieu (2006). "The meteorite fall at L 'Aigle and the Biot report: exploring the cradle of meteoritics". In Gerald Joseph Home McCall; A. J. Bowden; Richard John Howarth (eds.). The History of Meteoritics and Key Meteorite Collections. Geological Society of London. pp. 73–89. ISBN 978-1-86239-194-9. Levitt, Theresa (Sep 2003). "Biot's paper and Arago's plates. Photographic practice and the transparency of representation". Isis. 94 (3): 456–476. doi:10.1086/380654. PMID 14626764. Fox, William (1907). "Jean-Baptiste Biot" . In Herbermann, Charles (ed.). Catholic Encyclopedia. 2. New York: Robert Appleton Company. Chisholm, Hugh, ed. (1911). "Biot, Jean Baptiste" . Encyclopædia Britannica. 3 (11th ed.). Cambridge University Press. Wikimedia Commons has media related to Jean-Baptiste Biot. This page was last edited on 19 November 2018, at 01:56 (UTC).